This is a spacious 2 bedroom, 2 bathroom condo on one level with a large deck overlooking the lawn and stream area of Mountain Harbor. 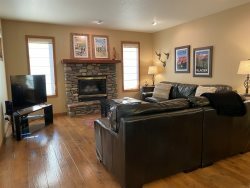 Within easy reach of the pool, hot tub, tennis courts and Whitefish Lake. 1 queen, 2 twins and 1 queen pullout sofa in living room. Stream view. Jetted tub in the Master bath. 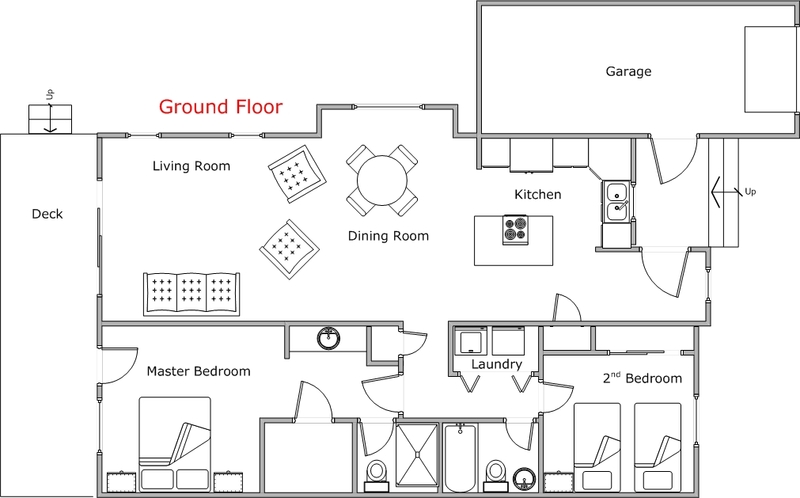 Amenities include: gas fireplace, fully equipped kitchen, washer/dryer and BBQ. This condo has a portable air conditioning unit in the living room. *Pool & Hot tub are open for summer. Hot tub is also open for ski season. We always enjoy staying at Mountain Harbor. Our only complaints were we could not get the WiFi working at all at our condo and second, when cooking, we found the utensils very limited. ~Thank you for your feedback, if you ever have issues with the WiFi or any other features in our condos, please call our office and we will send someone over right away to look at it. Great team. Available to answer questions and competence in the reservation process. Condo was just spotless, very impressive. Very well appointed and so clean, best rental experience we've had when finding a home on VRBO. Lovely!